Australian thriller and young adult author Matthew Reilly has written more than a dozen novels, multiple titles of which have been best-selling novels in his home country. The Great Zoo of China is perfect for fans of Preston & Child, James Rollins, and Michael Crichton, providing action on a gigantic scale, as the Chinese government prepares to introduce their extraordinary discovery to the world … with drastic results. Matthew Reilly on tour for Scarecrow and the Army of Thieves. Matthew Reilly reads from Scarecrow and the Army of Thieves. Matthew Reilly signs Scarecrow and the Army of Thieves. Matthew John Reilly (2 July 1974) is an Australian action thriller writer. His novels are noted for their fast pace, twisting plots and intense action. Matthew Reilly is currently considered a "single author." If one or more works are by a distinct, homonymous authors, go ahead and split the author. 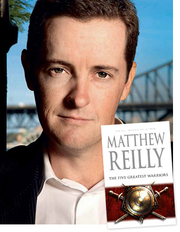 Matthew Reilly is composed of 9 names. You can examine and separate out names.